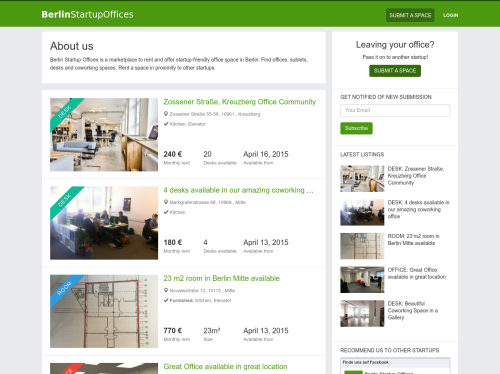 Berlin Startup Offices is a marketplace to rent and offer startup-friendly office space in Berlin. We think that a marketplace for office space is a missing piece in the Berlin startup ecosystem and it will do good things for the community. Startups usually have the same preferences when it comes to office space. So it makes sense if startups pass on their old offices to other startups or sublet desks when they have empty space in their office. Also, startups move very fast: They are growing fast and often need new space very quickly which at the same time creates the need to get rid of their old space. They also shutdown fast which also means they need to get rid of their old space to avoid unnecessary costs. Berlin Startup Offices is the marketplace to unbureaucratically trade office space within the startup ecosystem in Berlin. We got very positive feedback and startups like Small Improvements, Career Foundry and Global Leads Group as well as Investor XLHealth and Berlin coworking spaces like Agora are offering their office space on our website.